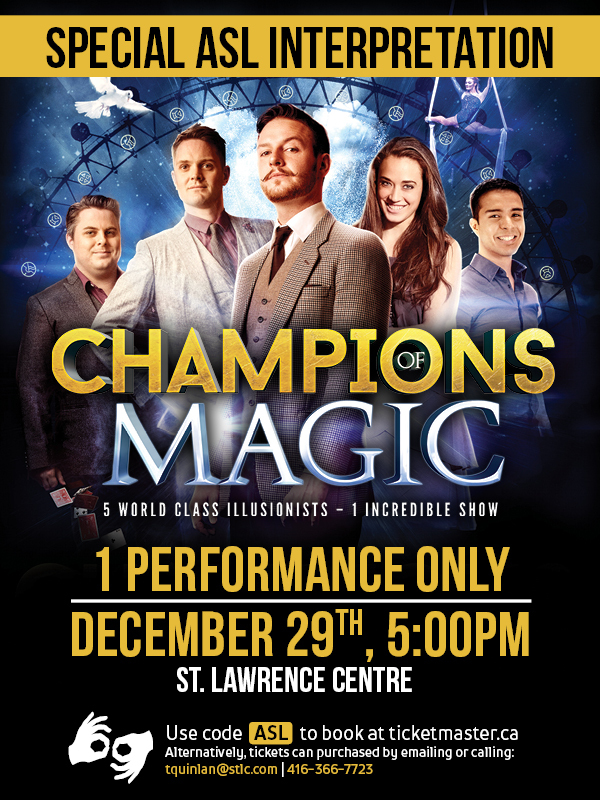 TORONTO, ON, DECEMBER 11, 2018: The holiday season just got a little more magical as ​Starvox Entertainment ​presents a very special performance of ​Champions Of Magic accompanied by American Sign Language (ASL) interpretation. On December 29 at 5:00 p.m. at Toronto’s​ Bluma Appel Theatre ​(​St. Lawrence Centre for the Arts, 27 Front St E), the UK’s mind-bending magical troop, will deliver their jaw-dropping, mind-bending performance and mesmerising illusions accompanied by ASL interpretation to Toronto for the first time ever. Champions Of Magic’s five world-class illusionists deliver a mesmerizing experience entertaining for the entire family. Featuring incredible illusions with sports cars, an impossible escape from Houdini’s water torture cell, mind-blowing predictions that must be seen to be believed, levitation from wonderous heights, and a finale beyond explanation, Champions of Magic showcases original magic that can’t be seen anywhere else. 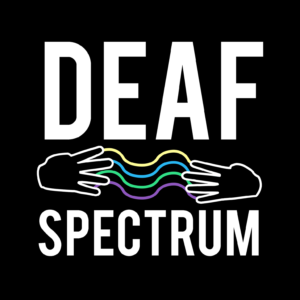 To reserve seats for the best ASL experience, please use code “ASL” when purchasing tickets through ​www.ticketmaster.ca. For assistance, contact the St. Lawrence Centre for the Arts box office via tquinlan@stlc.com or call 416-366-7723. Founded in 2005 by Corey Ross, Starvox Entertainment was ranked on Profit Magazine’s list of Canada’s top growth companies since 2012 – the only live entertainment company ever to be graded. In 2013, Mr. Ross was a producer on the Canadian production of Andrew Lloyd Webber’s ​CATS and annually produces a tour of ​Evil Dead – the Musical to record-breaking sales in Canada and the United States. Starvox has toured the west-end hit show ​Potted Potter: The Unauthorized Harry Experience since 2012 which continues to break records in Canada, the U.S., and internationally. Starvox is also the producer of ​Tre Parker’s Cannibal! The Musical and Faulty Towers Live! The Dining Experience in Toronto, a national tour of a new adaptation of Sherlock Holmes, starring David Arquette, ​Full House-The Musical and ​Dee Snider’s Rock ‘n’ Roll Christmas Tale,​ amongst other productions. Starvox has presented two productions written and directed by Woody Harrelson, highlighted John Malkovich in ​Giacomo Variations,​ and produced nationally-broadcast concerts for the Stephen Lewis Foundation featuring Alicia Keys, Annie Lennox and Harry Belafonte, as well as others. Starvox recently produced the multi-million dollar reboot of the classic Las Vegas revue show ​Jubilee f​or Caesars Entertainment, with pop mega-star Beyonce’s creative team at the helm. In the upcoming season, Starvox will produce the Wow Variety Spectacular for Caesars Entertainment’s Rio Casino, a Mexican tour for rock star Bryan Adams, and the Broadway bound Bend It Like Beckham the Musical.